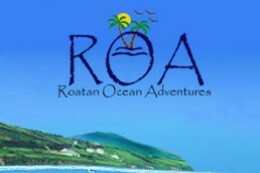 Join us at ROA for our EXCLUSIVE snorkel tour of Lobster City!! We take you to our private, reserved snorkel spot that we call “Lobster City.” Crystal clear water envelops you while you enjoy watching tons of lobsters in their natural habitat. But it’s not just lobster you will see! There are lots of conchs, stingrays, sea turtles and millions of beautiful fish. Because we personally protect the reef and marine water-life in our area, the sea is teaming with spectacular sea life that you won’t see in many other places on Roatan. We don’t allow hunting or fishing of these protected species and we help give you a healthy respect for our beautiful water, the world’s second largest barrier reef and its delicate eco system. We make sure that you see as much as possible during your time with us. Our expert guides are right in the water with you, not only pointing out the amazing underwater sights, but taking pictures for you with our underwater camera – which is included FREE with your tour! We then email the photos to you so you will have your memories for a life time. Oh – and when you enjoy our snorkel tour, you get a side trip to the Iguana Farm – FREE! We love to show what our experts are doing on land to preserve the endangered species of iguana here on Roatan. We are proud of our island, both land and sea, and want to preserve our natural resources for future generations. Snorkel Tour to Lobster City: 2 to 3 people = $40 each. 4 or more = $30 each. Cruise shippers! Contact us for special prices and information on shore excursions!